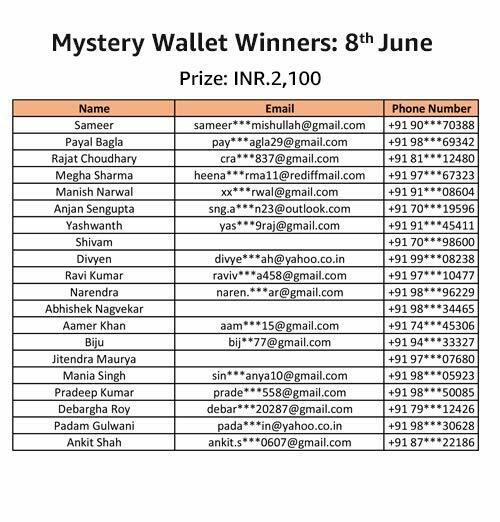 This 'Mystery Wallets' contest ("Contest") is made available to you on the amazon.in mobile application ("Amazon.in Mobile App") by Amazon Seller Services Private Limited. It is clarified that this Contest is not available on the website of the mobile sit www.amazon.in. Please read these terms and conditions ("T&Cs") before participating in this Contest. You agree that by participating in this Contest, you will be bound by these T&Cs and you acknowledge that you satisfy all eligibility requirements for the Contest, as provided below. This Contest will commence on [●] at 6:00 PM (IST) and end on [●] at 11:59 PM (IST) ("Contest Period"). c) open and enter any one of the three clickable wallet images (collectively, "Mystery Wallets") that are displayed on the Contest page. Each such customer who fulfils all the conditions mentioned in this clause is hereinafter referred to as an "Eligible Customer". 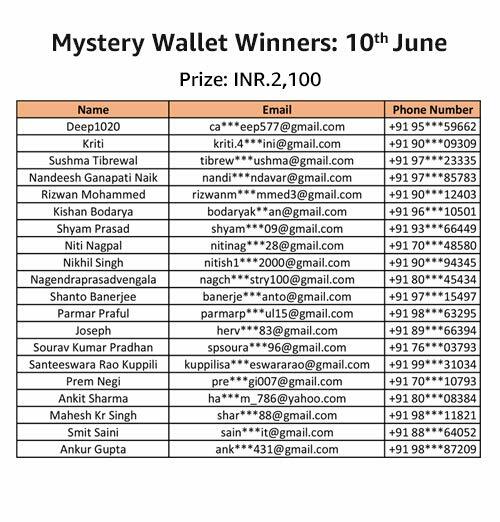 Amongst all the Mystery Wallets displayed on the Contest Page, clicking on 1 Mystery Wallet (amongst all that are displayed) provides 1 Eligible Customer a chance to win the Grand Prize (as defined below) ("Grand Prize Mystery Wallet") in accordance with these T&Cs. 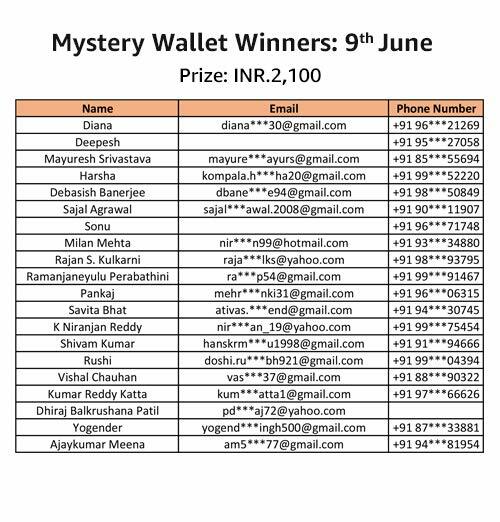 Clicking on either of the remaining Mystery Wallets provides 20 Eligible Customers a chance to win the Consolation Prize each (as defined below) ("Consolation Prize Mystery Wallets") in accordance with these T&Cs. For the avoidance of doubt, it is clarified that an Eligible Customer can click and open only 1 of the Mystery Wallets, from amongst the Mystery Wallets visible to the Eligible Customer. Out of the Eligible Customers who open and enter the Grand Prize Mystery Wallet, 1 Eligible Customer will be selected by a random draw of lots to be eligible to receive the Grand Prize, subject to such selected Eligible Customer correctly answering a Contest qualifying question ("Grand Prize Contest Question") within the stipulated time period. Out of the Eligible Customers who open and enter any of the Consolation Prize Mystery Wallets, 20 Eligible Customers will be selected by a random draw of lots to be eligible to receive the Consolation Prize, subject to such selected Eligible Customers correctly answering a Contest Question ("Consolation Prize Contest Question") within the stipulated time period. 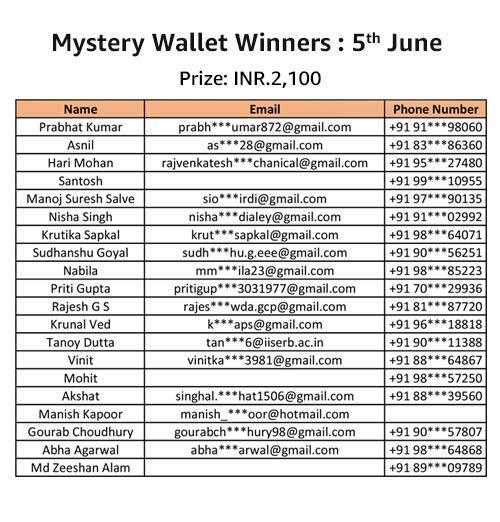 Amongst all Eligible Customers who open a Mystery Wallet and enter the Grand Prize Mystery Wallet, 1 Eligible Customer will be eligible to win Amazon Gift Cards issued by Qwikcilver Solutions Private Limited ("Gift Cards") for an aggregate amount of INR 1,25,000 ("Grand Prize"). 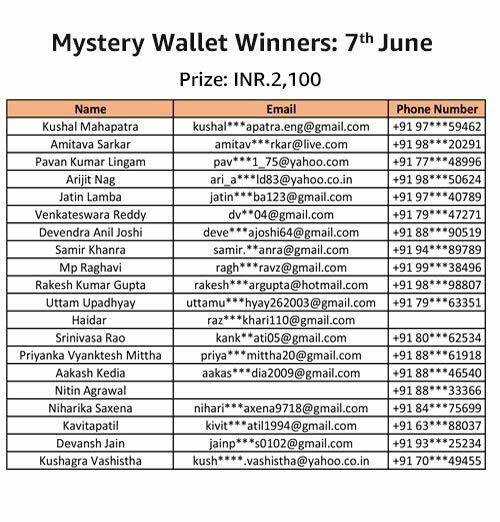 Amongst all Eligible Customers who open and enter any one of the two Consolation Prize Mystery Wallets, 20 Eligible Customers will be eligible to receive Gift Cards worth an aggregate amount of INR 2,100 ("Consolation Prize"). The Grand Prize and Consolation Prizes under the Contest are hereinafter collectively referred to as "Prizes". The Grand Prize Contest Question and Consolation Prize Contest Question are collectively referred to as "Contest Questions". Amongst all selected 21 Eligible Customers all of the Eligible Customers which correctly answer their respective Contest Question correctly and within the stipulate time period will be declared as winners of the Contest ("Winners"). The Winners will be eligible to win additional prizes if they provide minimum KYC in respect of the semi-closed prepaid payment instrument, namely Amazon Pay balance: Money, by submitting an official valid document number ("OVD number") for any of the documents mentioned at the page https://www.amazon.in/gp/help/customer/display.html?nodeId=202135160, provided that such submission is found acceptable by Amazon for completion of the customer identification process. Customers need to visit the page at http://www.amazon.in/ovd to provide the OVD number. By entering the Contest, you consent to being placed on a mailing list for promotional and other materials for Amazon or its affiliates. You may update or change your email preferences at the email preferences setting on Amazon.in Mobile App. Please note that similar contests or promotions may be running at the same time as this Contest. By entering into this Contest, you will not be eligible to receive any benefit and/or prize awarded in any other contest/promotion, unless you enter each contest/promotion separately. Also, in order to participate in this Contest, you must satisfy the eligibility and conditions for the Contest. (b) 20 Consolation Prizes worth INR 2,100 or INR 4,200, subject to these T&Cs. The Prizes will be distributed to the Winners on or before July 31, 2018. You agree to abide by the terms and conditions applicable to the Prizes and, including without limitation to the terms and conditions applicable to use or redemption of Gift Cards and the terms and conditions applicable to the use of Amazon Pay balance. Odds of winning the Contest depend on the number of eligible entries received for the Contest. Eligible entries are ones that satisfy the eligibility criteria outlined above and follow the steps outlined in the "Details of the Contest and the How to Enter" section above. The drawing for selection of the Eligible Customers will be aggregated at the end of the Contest Period. We will notify the selected Eligible Customers by e-mail following the draw, and they will be required to share a valid proof of identity and age in the form of a copy of PAN Card / Driving License / Voter ID / Indian passport. The selected Eligible Participants will automatically forfeit their claim to the Prizes if they do not meet the eligibility criteria or do not comply with these T&Cs. The Prizes will be awarded "AS IS" and WITHOUT WARRANTY OF ANY KIND, express or implied (including, without limitation, any implied warranty of merchantability or fitness for a particular purpose). There are no cash or other prize alternatives available in whole or in part. However, in circumstances beyond our reasonable control, we may substitute a similar alternative prize of equal or greater value in our sole discretion. If applicable, in the event any selected Eligible Customer does not respond back to any communication(s) sent in relation to a Contest within the time period communicated by Amazon, or answers the Contest Question incorrectly, he/she shall not be eligible to receive the either the Grand Prize or Consolation Prize, as the case may be. The selected Eligible Customer will also be required to prove his/her age, failing which he/she will be disqualified from the Contest. We may, to the maximum extent permitted by applicable law and in our sole discretion, change the T&Cs or cancel the Contest at any time; or modify, terminate, or suspend the Contest should viruses, worms, bugs, unauthorized human intervention or other causes beyond our reasonable control corrupt or impair the administration, security, fairness or proper play of the Contest or submission of entries. We may, in our sole discretion, disqualify any individual found to be: (a) tampering with the entry process or the operation of the Contest or Amazon.in Mobile App; (b) acting in violation of these T&Cs; or (c) acting in an unsportsmanlike or disruptive manner or with intent to annoy, abuse, threaten or harass any other person. If your entry is incomplete or if you use robotic, automatic, programmed or similar entry methods, your entry will be void. The authorized subscriber of the e-mail account associated to the Amazon.in account used to enter the Contest at the actual time of entry will be deemed to be the participant and must comply with these T&Cs in the event of a dispute as to entries submitted by multiple users having the same e-mail account. The authorized account subscriber is the natural person who is assigned an e-mail address by an internet access provider, on-line service provider, or other organization responsible for assigning e-mail addresses for the domains associated with the submitted e-mail addresses. Except as provided herein, no benefits/ prizes greater than those described in the "Description of the Contest and How to Enter" section above in these T&Cs will be awarded. Amazon may communicate with you in relation to these T&Cs or this Contest, through itself or through its affiliates, and you hereby agree and give your consent to be communicated. The Contest is governed by the laws of the Republic of India. The Contest and all accompanying materials are © 2018 by Amazon, or its affiliates. All rights are reserved. No requests for transfer or assignment or redemption of the Prize(s) shall be entertained. You agree that all our decisions related to the Contest are final and binding on you. Failure by Amazon to enforce any of these T&Cs in any instance shall not be deemed to be a waiver of the T&Cs and shall not give rise to any claim by any person. The decision of Amazon shall at all times be binding and final. These T&Cs are subject to Indian laws and the courts at New Delhi shall have the exclusive jurisdiction in respect of any disputes or any matter arising here from. This Contest is subject to force majeure circumstances including without limitation, floods, natural disasters, war, act of terror, political unrests, technical snags, act of God or any circumstance beyond the reasonable control of Amazon ("Force Majeure Event"). Amazon shall not be liable for any delay or adverse effect caused to the participants in this Contest as a result of a Force Majeure Event. By participating in this Contest, you give Amazon or its affiliates permission to use your name, likeness, image, voice, and/or appearance as such may be embodied in any pictures, photos, video recordings, audiotapes, digital images, and the like, taken or made in relation to this Contest and any promotions, events, or contests to follow. You agree that Amazon and/ or its affiliates have the right to publish your saved item details for any communication, promotions, events, or contests that follow. You agree that Amazon and/ or its affiliates have complete ownership of such pictures, etc., including the entire copyright, and may use them for any purpose. These uses include, but are not limited to illustrations, bulletins, exhibitions, videotapes, reprints, reproductions, publications, advertisements, and any promotional or educational materials in any medium now known or later developed, including the internet. You acknowledge that you will not receive any compensation, etc. for the use of such pictures, etc., and hereby release Amazon and/ or its affiliates and its agents and assigns from any and all claims which arise out of or are in any way connected with such use. You give your consent to Amazon and/or its affiliates, agents and assigns to use your name and likeness to promote this Contest and any promotions, events, or contests to follow. This Contest is being made purely on a 'best effort' basis and participation in this Contest is voluntary. By participating in this Contest, you will be legally bound hereby, to release from liability, and hold harmless Amazon, and any of its affiliates, employees or agents representing or related to Amazon for any matters in relation to this Contest, including the Prizes. This release is for any and all liability for personal injuries (including death), property loss or damage, and misuse of the benefits/ Prizes offered under this Contest, in connection with any activity or directly or indirectly, by reason of the acceptance, possession, or participation in this Contest, even if caused or contributed to by our negligence. The names of the Winners under the Contest will be announced within [●] from the expiry of the Contest Period. Please direct any questions, comments or complaints related to this Contest to Amazon's customer service through your Amazon.in account. All information submitted in connection with this Contest will be treated in accordance with these T&Cs and the Privacy Notice available at Amazon.in Mobile App.